Draws arcs by a variety of methods. On each Arc icon a large green dot ( ) indicates the first point that you pick. A small green dot ( ) indicates the second point, and a small white dot ( ) indicates the final point. Continues the arc tangent from the last point picked. 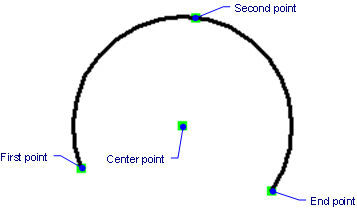 Specifies the center point of the arc. 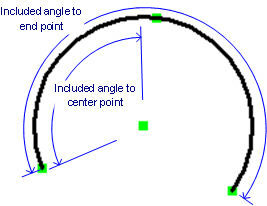 Continues the arc tangent from the last point picked (same as pressing Enter). Specifies a different start point for the new arc. 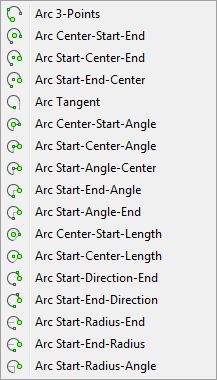 Select the arc. Notice that it has four grips. Drag the endpoint and midpoint grips to stretch the arc. Drag the center grip to move the arc. Circle - draws arcs and circles. 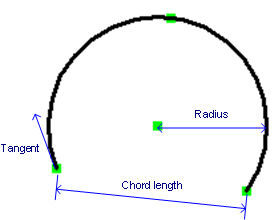 Ellipse - draws elliptical arcs. PEdit - converts arcs to polylines. PLine - draws connected polyline arcs. DimRadius and DimDiameter - dimensions arcs. Change - changes the endpoints of arcs. Center - snaps to the center of arcs. Endpoint - snaps to the endpoints of arcs. Quadrant - snaps to the 90-degree points on the circumference of arcs. Tangent - snaps to the tangency of arcs.